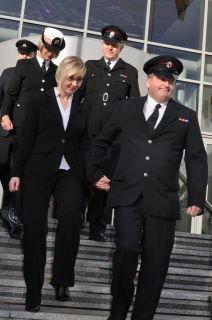 fire service managers will reappear in court on January 20th charged with the manslaughter of four of their colleagues who died in a blaze at a warehouse in Warwickshire. As you are no doubt aware it has been four long years since the tragic fire at Atherstone, this has put an unbearable strain on all those concerned and their respective families. All involved need closure and indeed the fire service itself waits with bated breath for the outcome, because the future of the fire service as we know it rests with this decision. The next Court date has been arranged for the 20th January, this has now been confirmed at Wolverhampton Crown Court and it is expected that an appeal will be made to the Judge to dismiss the case. support@supportwarwickshirefirefighters.co.uk as coach transport has been booked with local pick ups from Leamington Spa and Nuneaton. You have been tremendous in your support in so many guises: signing our petition, attending hearings, signing the guestbook on the web page, donating towards raising the awareness for our campaign, displaying our campaign car sticker or wearing one of our supporters t-shirts. Whichever it may be, or indeed all – we are eternally grateful and are very humbled that you continue to support us. The 20th January is an incredibly important day as this is possibly the last opportunity for the case to to be dismissed before it is expected that it will go to trial in April/May. This case affects every one of us – why? 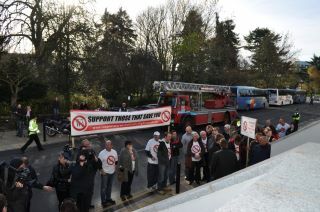 Going forward the decision will have an impact on health and safety issues, for all the emergency services . The question is likely to be that senior officers may hesitate at an emergency scene as they deliberate that should something tragically go wrong will they find themselves in the dock, as the Warwickshire Three are now. Fire Scenes are unpredictable and dangerous, even with the best training in the world things still can go wrong, that is why it is vitally important that fire fighters are unrestricted and can act as they see fit at the time without the fear of prosecution. I am sure you will agree that the fire service is a tremendous service, often undervalued and overlooked until we need them, please show your support and come along on the 20th January. Thanking you in advance for your continued support and we look forward to seeing you on the 20th. Coaches to depart from Leamington Spa and Nuneaton on the 20th January. Approx times are depart Leamington at 7.45am and Nuneaton 8.15am. These may change as confirmation still not received re court time. Please email and reserve your space! Station manager Timothy Woodward and watch managers Paul Simmons and Adrian Ashley were charged with gross negligence manslaughter in February after a long-running inquiry into the fire in Atherstone-on-Stour, Warwickshire, in November 2007.Warwickshire County Council also faces a charge of failing to ensure the health and safety of its employees in relation to the blaze, which claimed the lives of firefighters Ian Reid, John Averis, Ashley Stephens and Darren Yates-Badley.None of the defendants was required to enter a plea to the charges at Friday’s hearing at Warwick Crown Court in Leamington Spa.Simmons, 50, from Hampton Magna, Warwickshire, Ashley, 45, from Nuneaton, and Woodward, 50, from Leamington Spa, were all bailed until a further hearing, expected to take place at Stafford Crown Court in January.